I had planned this trip on a shoestring budget and hence did not want to spend a bomb on accommodation. 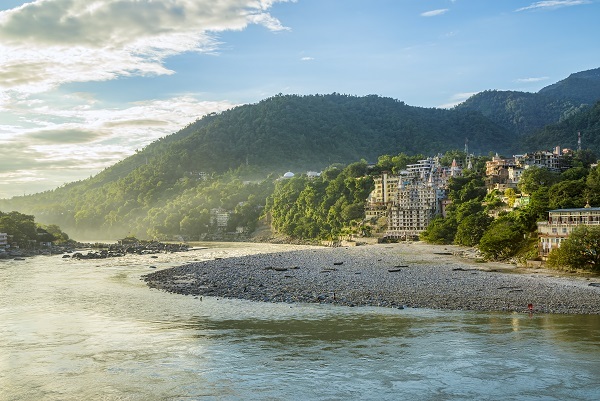 A friend from Delhi had told me about a recently opened hostel there called Zostel so once I reached Rishikesh bus stop I took an auto to Tapovan where the property is located. On reaching Tapovan I called up the number available on the website and was guided to the hostel. 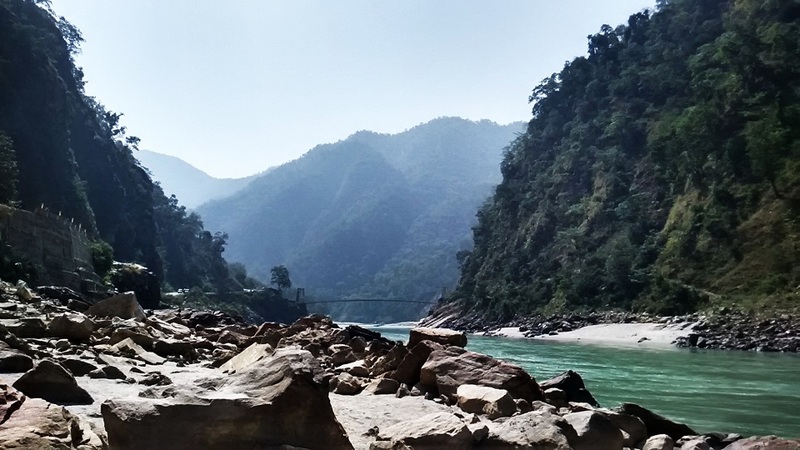 It is located at a convenient place, quite close to the Ram jhula. It is a cosy, beautiful property, ideal for budget travellers. 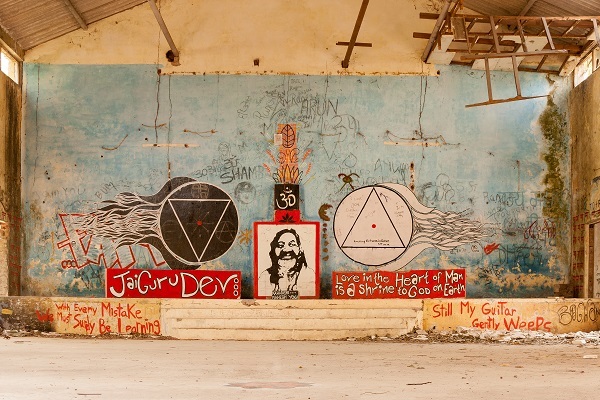 I was happy to see the concept of backpackers’ hostel and social travel catching up in India. I took a room in their mixed dorm, kept my luggage in one of the lockers and went out to explore the town. After a long journey, I was fairly hungry and wanted to eat at one of the riverside cafés Rishikesh is quite famous for. 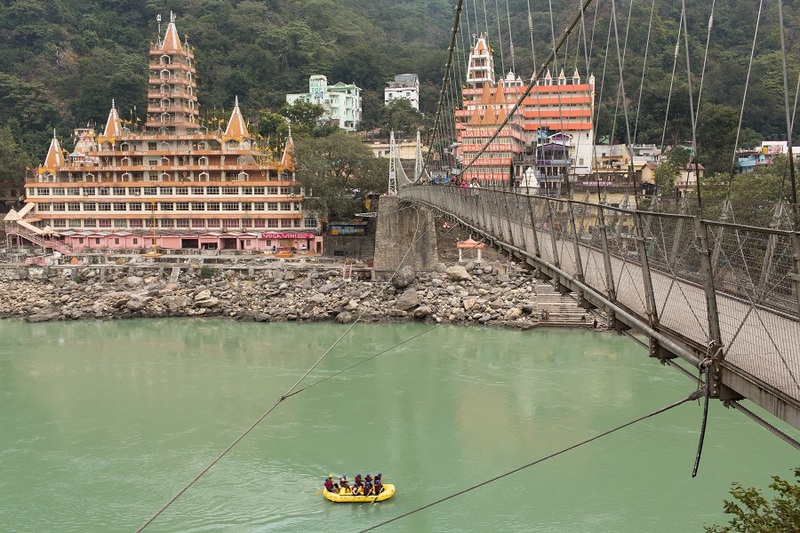 The guy at the counter at Zostel told me about a few of them close to the Laxman Jhula. So I took an auto to the place and went to a café called ‘The Office”, that serves the best banana nutella samosas in the entire town, and possibly in the entire state. I had an entire evening to spend, so I decided to sit and read at the Ganga Beach Café, which, as the name suggests, is a cozy little place on the banks of river Ganga. The book I was carrying was ‘Siddhartha’ by Hermann Hesse, that deals with the spiritual journey of self-discovery of a man named Siddhartha during the time of Buddha. 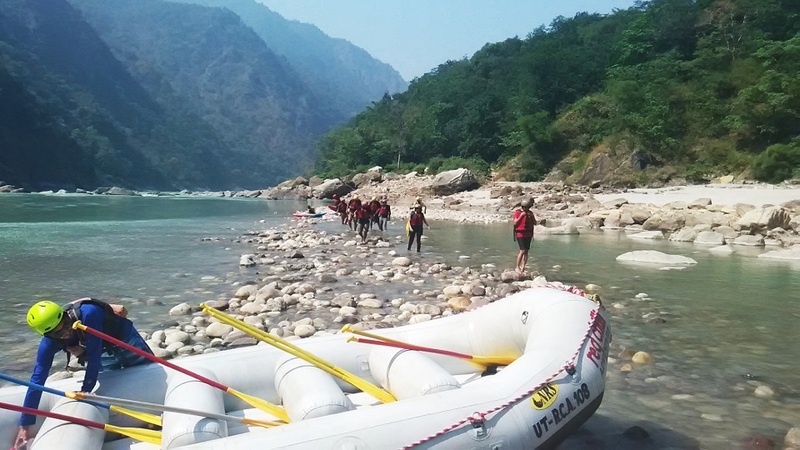 My second day at the place deserved to be an adventurous one and so I decided to try my hand at the sport Rishikesh is known for- rafting. 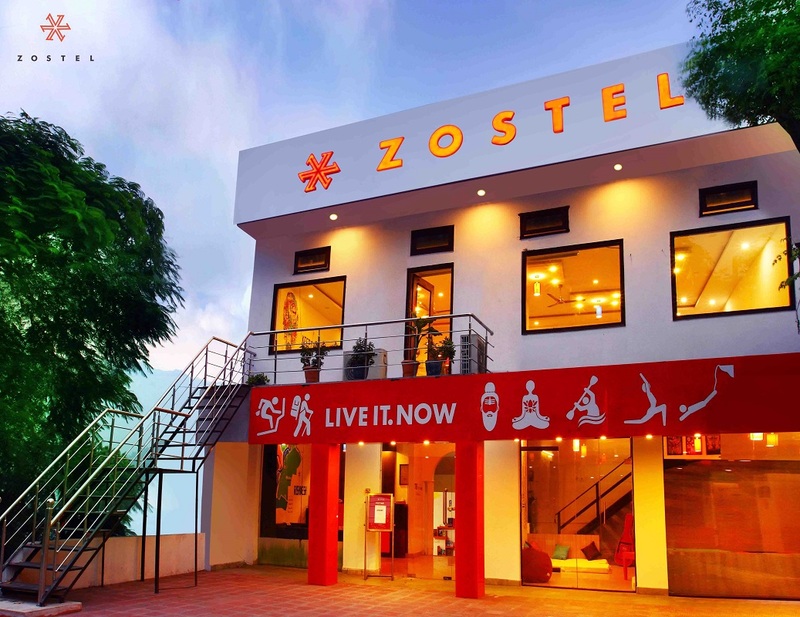 The people at Zostel had helped me with all the details and I’d managed to find myself a trainer. At 9 in the morning, I found myself at the rafting site staring at the gushing waters and waiting eagerly to meet them. There, I met Tom an expert rafter who would also be my trainer. He told me that we would cover a total distance of 26kms in approximately 4 hours. He taught me some basic signs, which I was supposed to use in case I wanted to communicate with him while rafting. I, along with eight other people, all of them strangers, went on an adventure of a lifetime. As we kept tossing over the white waters, I came into close contact with the power and might of nature that made me revere it even more. During the entire trip we came across several rapids such as Good morning, Three Blind Mice, Crossfire and Club House (as identified by Tom). At many points during the session we felt that our raft would turn upside-down but thanks to Tom’s decisiveness and our meticulous following of instructions, nothing unfortunate happened. Tom was an amazing instructor, a rockstar, but he spoke very little. And I am a curious cat, so I pestered him to no extent and after much prodding he gave in. I learned that he was basically from England and had been living in India for three months then. He has rafted around the world, in some challenging spots like Zambezi, where getting down from your raft abruptly meant sure-shot death. And then I realized, he too, like Siddhartha from the book I was reading, has a definite goal in mind, and that goal is to stretch his boundaries to the farthest point. It takes courage to get out of your comfort zone and explore dangerous terrains especially when most of the people around you are totally smug and satisfied in the sheltered life they are leading. The day was physically tiring and my mind was almost saturated with a lot of things. I did not have much energy left to do anything else, so I headed to a café for a light lunch and then went back to Zostel to rest. Once I woke up, I decided to stay at Zostel and cook my own dinner at their kitchen. So Zostel has this well stocked kitchen where you can nurture and hone your culinary skills. I am a good cook and the food I made was just fine because my fellow travellers liked it as well. After dinner we went to the terrace for an impromptu jamming session. After two hours of continuous dancing and singing, we all were tired and went back to our respective dorms to sleep. I had yet another day in this beautiful place to look forward to. Yes, it was an eventful day, after which I went back to Zostel for yet another evening filled with fun, music and some of the best people I have ever met. It was my last night at Rishikesh, and I had to make it count. We sang, danced and talked till morning, after which I bade them farewell, hoping to meet them sometime soon in future. May be this is how Siddhartha attained enlightenment.